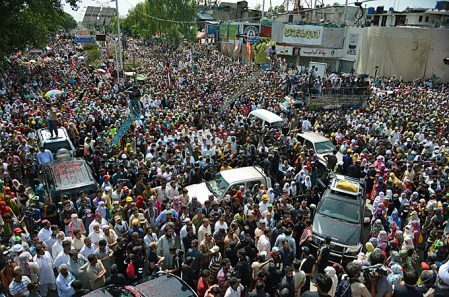 The past nine days have been no less than a chaotic event experienced by the citizens residing in the capital of Pakistan. Seized by the religious groups due to the error in the recent controversy of Khatam-i-Naboowat (finality of the Prophethood) while passing the law in the Election Act 2017 which took place last month. With the religious members seizing the roads of Islamabad, the locals are currently troubled as it is making commuting extremely strenuous. While the troubles were limited to extreme traffic situations, who knew, it could actually lead to someone’s death. Note: Raina Iqbal, the cousin of the victim has requested Parhlo to respect the dead and therefore, the identity of the deceased is hidden. Today I’ve lost my 26-year-old cousin. She was traveling from Islamabad to our hometown Gujrat with her friend when their van collided with a truck. There was no ambulance on the scene because of the protest/blockade/dharna at Faizabad. People passing by stopped and started cutting the seats open to free her from under the rubble. Still no ambulance. Her purse and cellphone were immediately stolen. Her friend gained consciousness and called her brother to pick them up and take them to the hospital. The nearest hospital refused to take her because it was an accident case even though at this point she was internally bleeding with broken legs, arms and spine. It took AN HOUR to get to the other hospital because of the dharna. By that time doctors said she has 5-10% chances of living. This was two days ago. She was pronounced clinically dead this morning. 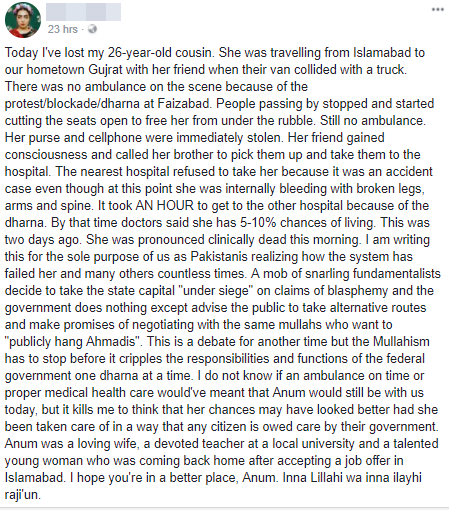 I am writing this for the sole purpose of us as Pakistanis realizing how the system has failed her and many others countless times. A mob of snarling fundamentalists decide to take the state capital “under siege” on claims of blasphemy and the government does nothing except advise the public to take alternative routes and make promises of negotiating with the same mullahs who want to “publicly hang Ahmadis”. This is a debate for another time but the Mullahism has to stop before it cripples the responsibilities and functions of the federal government one dharna at a time. I do not know if an ambulance on time or proper medical health care would’ve meant that Anum would still be with us today, but it kills me to think that her chances may have looked better had she been taken care of in a way that any citizen is owed care by their government. Anum was a loving wife, a devoted teacher at a local university and a talented young woman who was coming back home after accepting a job offer in Islamabad. I hope you’re in a better place, Anum. Inna Lillahi wa inna ilayhi raji’un. While the religious fanatics wish to make a point of their own, the troubles they are causing to individuals such as Anum are being ignored. This young individual had her entire life ahead of her. Denied due to the system, been in a tragic accident due to the system, a family lost a wife, a teacher, a daughter and a human. It is upsetting to see how the government even in the federal capital of the country is not taking any action. No news circulated on the media regarding the death of Anum. Perhaps we as an entire country have failed, yet again. “US Ambassador to Pindi Boyz” Sums up the Decision against Centaurus Mall with the Best Comment!